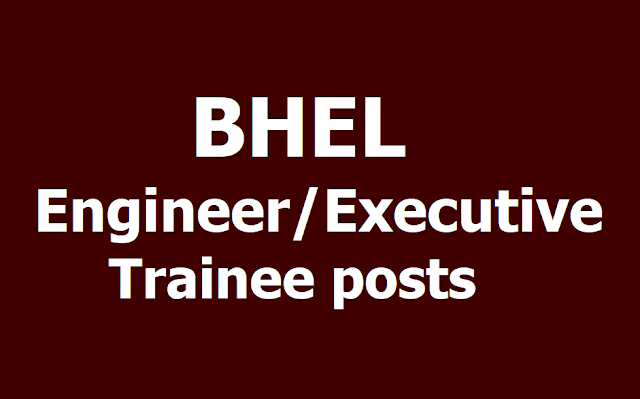 BHEL Engineer/Executive Trainee posts Recruitment 2019, Apply online upto May 6: Bharat Heavy Electricals Limited, BHEL has published a recruitment notification and BHEL invited candidates to fill up 145 Engineer/Executive Trainee posts. Candidates who want to apply for the post can visit the official site of BHEL Careers at careers.bhel.in and apply. The last date to apply for the posts is till May 6, 2019. Engineer Trainee in (Mechanical/ Electrical/ Civil/ Chemical): Full-Time Bachelor’s Degree in Engineering /Technology or Five year integrated Master’s degree or Dual Degree programme in Engineering or Technology in the disciplines of Mechanical or Electrical or Civil or Chemical Engineering from a recognized Indian University/ Institute. Executive Trainee in (HR): Full time regular Bachelor’s degree from a recognized Indian University* with at least 60% marks in aggregate in all years With Two years full-time regular Post Graduate Degree/Diploma in Human Resource Management/ Personnel Management and Industrial Relations/ Social Work/ Business Administration with specialization in Personnel Management or Labour Welfare or HRM from a recognized Indian University/ Institute** with minimum 55% marks in aggregate of all years/semesters. Executive Trainee in (Finance): Full-time regular Bachelor’s degree from a recognized Indian University* With Qualified Chartered or Cost and Works Accountants from recognized Institutions in India. Candidates will have to appear for Computer Based Examination. Based on the Examination Marks and requirement, candidates will be shortlisted for Interview. Candidates joining BHEL as Engineer/Executive Trainees will undergo training for one year. Those candidates who will be selected for interview should be able to furnish their Degree/Final Year Mark Sheet at the time of interview. Candidates willing for more information can visit the official site of BHEL.